When I first put this disc in the player, I wondered if I would really enjoy it. I had just listened to a performance of the Tchaikovsky played by Sviatoslav Richter accompanied by the Leningrad Philharmonic under Evgeny Mravinsky. Obviously, the first characteristic was a vast improvement in the recording quality over the mono Russian recording (Leningrad, 1957). As the new disc got underway I was very pleasantly surprised, as André Watts, although not Richter, gave a very proficient and exciting reading. In addition, although the Atlanta Symphony is not quite the match for the Leningrad Philharmonic under Mravinsky, Yoel Levi made a very creditable accompaniment to his soloist, and the Telarc sound quality is as good as it gets. These Telarc re-issues are sometimes enhanced by combining two CDs on to one, or by adding additional material, but this one appears to be a straight re-release of the earlier disc. This was originally issued in the U.K. in 1995, and is still listed in the RED catalogue at full price. If you go searching for this one be wary of old stocks in shops still at full price. A further complication of these Telarc re-issues is that they normally retain the original, full price catalogue number. I know that this allows the company to re-cycle old stocks more efficiently, but it can be confusing for the consumer. Both concertos are given rip-roaring interpretations, and I cannot imagine that anyone coming to these performances for the first time will be anything than thoroughly delighted. André Watts certainly proves the point to the criticism made by Anton Rubinstein that Tchaikovsky�s concerto was unplayable, and that he should have not wasted manuscript paper on such worthless, commonplace and awkward work. Whilst I am fully aware that today it does not cause technical problems for wary performers, it takes a true virtuoso to be able to throw it off as Watts does here. The concerto�s dedication to Rubinstein was changed to Hans von Bülow, who premiered it to a rapturous audience in Boston, and then took it to concert halls all over North America. Rubinstein eventually toured with the concerto which again met with acclaim wherever it was played. 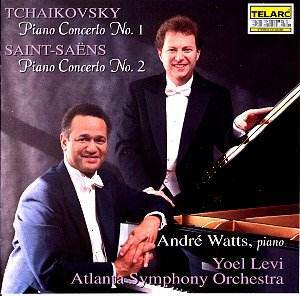 André Watts� skill in interpretation applies equally to the Saint-Saens, with its Bach-inspired first movement moving inexorably to a fine conclusion and completed by two shorter movements, first a lilting Scherzo and then a hell-for-leather finale. Anton Rubinstein also had his finger in the pie of this concerto since he asked his friend, the French composer, to produce something for him to conduct at his first concert in Paris. In seventeen days, this second concerto was written and completed, and the first performance was given by the composer with Anton Rubinstein presiding. This disc is recommended highly, but check that you are not being charged full price. Fans of this company will not be in the least disappointed with the playing and/or sound of this disc.